Family members say goodbye to a loved one killed in Bangkok’s street fighting last week during a chanting ceremony in Wat Hualamphong in central Bangkok Thursday. In the Therevada Buddhist tradition a person is cremated upon death, it follows the tradition of cremation in India and the example of the Buddha, who was himself cremated. Cremation usually takes place shortly after death, however it can be delayed to allow for a long mourning period at the request of the family. That is what’s happening right now in Bangkok. After the street fighting Saturday hundreds of people were hospitalized. Many with critical injuries are still in intensive care. One died today and more are expected to die in coming days. 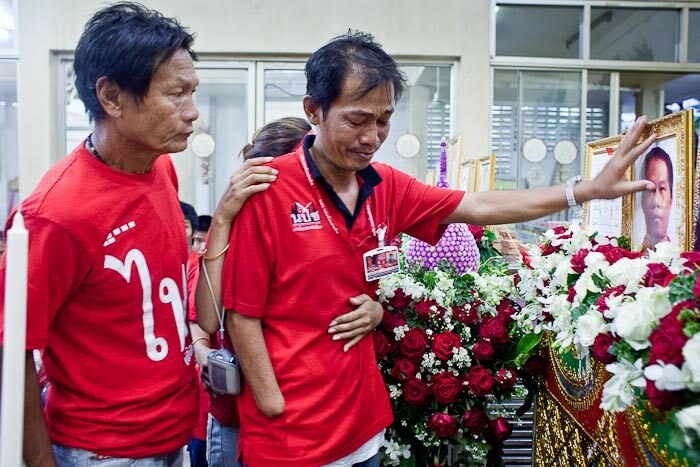 Many of the families are cooperating with the Red Shirts leaders and delaying the cremation until the end of a lengthy mourning process (a few may have been cremated in their villages already). No one has said yet when the funerals will take place. During the mourning period, monks meet daily with the family to chant the Abhidharma. Tonight’s chanting was the first in a temple (the bodies, which are in chilled coffins, have been lying in repose at Democracy Monument, they were moved to a temple early today). It’s a private ceremony - only about 50 Thais were there. I went to the temple early today, before the ceremony, and was invited to come back for the service. This speaks volumes about the nature of the Thai people. I don’t speak Thai and today I didn’t have a translator with me. I asked around at the temple for someone who spoke English and a man stepped forward. I asked when the cremations would be and he told me they didn’t know yet, but that the chanting would be tonight and that I should come back for the ceremony. He knew I’m a journalist - with the cameras around my neck there’s no mistaking that. This evening, I made it a point to get to the temple early to make sure there would be no problems. I was treated as an honored guest, directed to sit in the front row with some of the monks who weren’t chanting (an offer I declined - I stood and moved around through the service) and offered drinks and food. I was honored to be able to photograph the ceremony. There are more photos from the service in my PhotoShelter archive and available from ZUMA Press.